Leatherhead has come to the city searching for the Turtles. While crawling through the sewers he encounters the Rat King who charges him with trespassing. 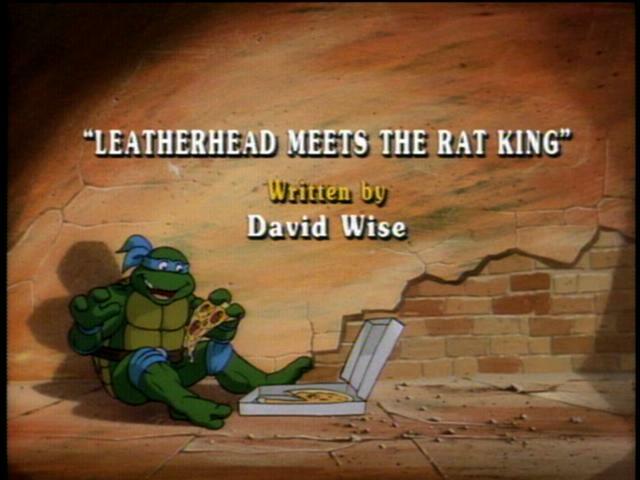 Leatherhead unsuccessfully defends his right to go where he pleases and The Rat King takes him prisoner. Meanwhile, Splinter instructs the Turtles to practice their ninja jskills against cardboard cut-outs of Krang, Shredder, Rocksteady and Bebop. But Michaelangelo would rather fight the real thing — until then he would rather catch some rays and pizza. Over at Channel Six News, Burne Thompson assigns April to cover a story of the hijacking of a truckload of rat poison. Along with Irma and Vernon, April discovers clues that lead her to believe that The Rat King is responsible for the hijhacking. As they follow a trail that they hope will lead them to The Rat King’s lair, Irma and Vernon are caputed by The Rat King, who plans to use them as test subjects for his ultimate plan to “rule the world”, while April escapes only to be captured by Leatherhead, who had successfully escaped from The Rat King’s lair. While Leatherhead leads April to another part of the sewer, she successfully contacts the Turtles. And while she waits for them to come to her rescue, Leatherhead explains The Rat King’s plan to “rule the world.” It seems that he has added some of his own ingredients to the stolen rat poison that will enable him to use it against humans — causing them to become mindless zombies and slaves to his rats. The Turtles arrive just in time to rescue April, Vernon and Irma while Leatherhead and The Rat King duke it out. Leatherhead decides to return to the Florida swamps while the Rat King vows to get his revenge.